grouser (Ludlow, United Kingdom) on 12 January 2011 in Landscape & Rural and Portfolio. Whoops, we spring backwards for this view from the top of the waterfall that I had missed in my hurry to get to the accident:) The waterfall is actually split into two big drops. The first shot in the series showed the lower one. This is the view from the very top, where it is possible to walk across next to the edge, with care. We are looking down into a pool, where Monks are bathing, just above the lower drop, the top of which can just be seen on the extreme left of the frame. Ouch to the head wound, I've just read about it....hope you are all recovered from that. 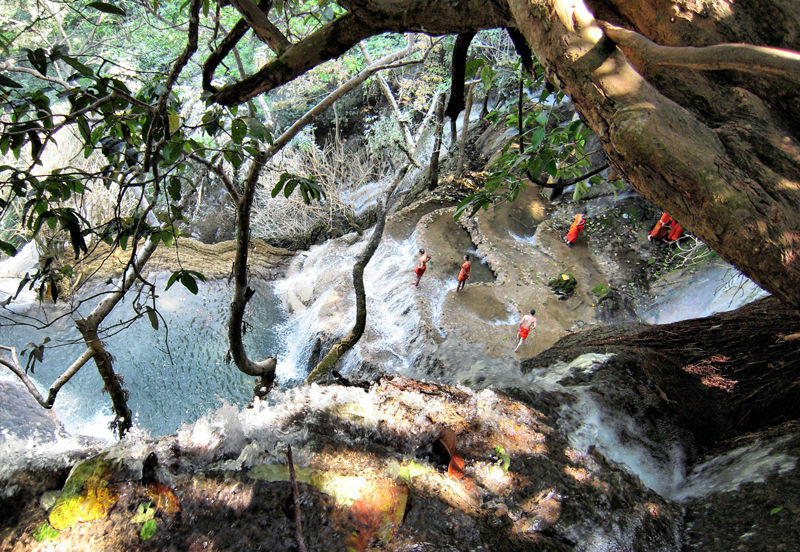 And to this shot....scary heights, but those monks look ready to jump into the waterfall. Lovely aspect for this shot. Amazing angle - a sense of vertigo! I love all the details and colours you get in this scene. Now if you had received your head wound after taking this shot I wouldn't have been surprised! And I bet you posted this just to make me feel uncomfortable again! Lovely shot. This is the one that I prefer most so far. Loads going on-but framed so well, amazing colours, intrigue, natural beauty-all great! @CElliottUK: Me too, it's why i felt the leap backwards in time was justified:) It's not often you can walk across the top edge of a waterfall. Very very beautiful ! A great photo ! Cracking good view, not sure if I would have the nerve to take this shot. Suddenly, after reading of the mishap, everything here looks highly dangerous ! I hope you were roped to a tested tree or something . On suit le cheminement de la lumière et on plonge avec elle dans la cascade! Belle baignade en perspective! cool pov and wonderful colours! Thats a long way down !! you´d need a bit more than a stiched on bandage for your head if you took a tumble here !!! Cool POV and a nice candid shot !! A fine point of view makes this shot a remarkable image. It takes a bit of looking to grasp the full extent of the image this provides. Very well done. place to be to photograph. Great shot from the vantage point, and can only repeat, it sure reminds me of the Krka Falls near Sibenik! Amazing POV, framing, colours... Really great photo!